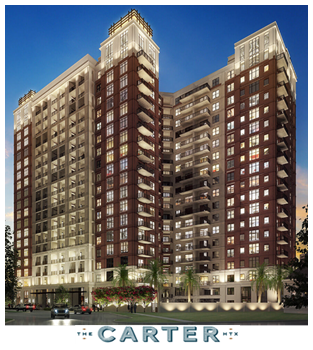 ​HOUSTON – Streetlights Residential has completed construction on The Carter, a new 24-​​story multifamily high-rise located at 4 Chelsea Blvd. in Houston’s Museum District. The Carter has a total of 305 units and includes a resident bar, 24-hour concierge service, and an expansive fitness center. Residences range in size from 723 sf for a one-bedroom to 3,329 sf for the biggest penthouse.